Dear Lord, I pray in abundant thanksgiving for the grace of faith, and for the gifts of the sacraments of Baptism, Confirmation and First Communion. May all souls find peace in this life on earth, by walking in the Light, toward our Risen Lord Jesus. May Mother Mary guide more atheists and agnostics into our beautiful Church, home of our hearts’ true yearnings. I offer this Novena for a special intention: that I may receive the guidance of the Holy Spirit in finding a vocation that makes use of my particular strengths while helping me to embrace my weaknesses. May I find a way to become more devout, more humble, less arrogant, less over-bearing. I need prayers for my son who is suffering from his shoulder and some internal problems .And for me need prayers for my foot the one i could of bere weight on i lost the support of it. so have to remain in bed for i don’t know when .Prayers for my family and friends who is taking care of me. May bless everyone who is praying these novena. Blessing. Lord, please pray for the healing of mommy, nanay and daddy’s especially in their relationship. Lord i pray and await for your coming. I also ask to give me wisdom so my husband my get closer to you. That God will allow a lovely man in my life to date fall in love, leading to holy lifetime of happy marriage til death. & he truly loves me unconditionally & he loves & supports me wonderfully. 4 true happiness, much better health/help me 2 loose this unnecessary weight, a lovely life of always true praise to God always 1st. 4 a huge change of conversion of ppl to join the catholic church, along with a huge abundance of men becoming priest t/o this country & world. Peace in my immediate family. Finances to become much better. Etc etc. Pray to the Lord. Please pray for baby boy Beau who is struggling after chemo. He is having a very difficult time. May God bless him with a miracle. 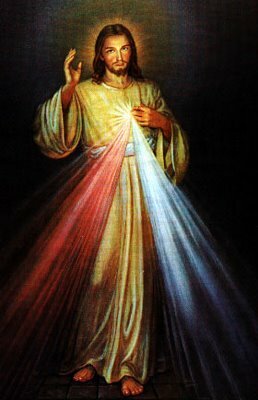 Divine Mercy be with me I need you everyday thanks. I offfer this Novena for a special intention regarding my job and life situation. May I get to know which direction I should go. I pray and give thanks for all the work my sister does in order to help our mother. For my brother and his difficult job situation. For my oldest brother, his family and children. For the renovation of our very old house. For the very bad relationship and never-ending problem with our neighbours. May it changes a little at least. Most Holy Lord, Please hear our prayers for all the people in this small community. There are issues that are problematic.. Almighty Knowing Lord we pray now especially for our financial needs. Also, that this current issue where we live is handled correctly and all persons are satisfied. Holy Almighty Lord, may Divine intervention aid us in selling our property & may your will be done. May the right buyers come soon to buy our beautiful home. I know that all things happen in your most precious time. Please continue to deepen our faith and to have strong convictions to do your Holy will. Help us to be more knowledgeable in learning scripture in order to spread the Holy Gospel. Send forth your Holy Spirit & kindle in us the fire of your Love. I trust in you Jesus. Amen ???? ???? ???? Lord Jesus Director of The Universe, Thank you for all blessings received and prayers answered. Jesus please place your healing hand upon my daughter and take back all her illnesses, pain and suffering it’s been almost 15 years since she became disabled, please give her more and more good days, awesome days she so deserves miracles here and now. Jesus please answer her prayers, wishes and dreams now for whatever she wants and desires now and in the future – I so want to watch my daughter enjoy life once again it’s been too long since she had the health and funds to do the things she so wanted to do prior to becoming disabled. Jesus please let us sell our mobile home unit #11 in Las Vegas for cash, and please let the park approve the buyers so we can close without delay and let the buyers close on their 3 mobile homes and land without delay. Dear Jesus, i pray tat my son will find a good house, a walking distance fr his collage where he can stay safely n with basic needs provided or easily avalaible. Help him to hv good house mates who will be caring and helpful to each other. Lord Jesus bless and protected Jeroyd and his friend from evil and danger. Give him good health n good friends. May he do well in all his exams and assignments. Hv mercy on him Lord. Amen. Heavenly and lovingly father,im here again to give thanks and ask forgivess of all the sins ive done.Lord Jesus im applying for a position as Teacher 1,i hope lord that i can have it this job. Christ i am not with out you. I’d like to add my sister and her family to our prayers intentions as she has just informed us that she has just go through a miscarriage. This would be her 4th miscarriage. She has 3 beautiful living and 4 babies in Heaven with Our Lord! May God’s peace be with her and her family and Our Lady hold then all under her mantel! Lord Jesus, i thank and glorify you for the many blessings that you shower upon us. Please continue to bless my husband spiritually and financially.I pray for my son to have a good health and that he may become more active in sports. I pray for God’s protection in my work and that I may be given a chance to improve further my career. In Jesus name I pray. Amen. Dear father I place my financial needs into your hands . I pray for money to pay my son’s tuition fees. Dear jesus I pray that my son would be successful with his exams. I pray that my son would be successful , I pray that I would get a new car. Jesus I ask for pray for Donald Bedford that you can bless him with a job soon please Jesus he need a job Jesus. And Jesus bless me that Donald ask me to be his wife Jesus I love him Jesus so Jesus please answer my pray request. A prayer of thanksgiving for Mom’s 100th birthday party. People enjoying each other’s company etc. That Mom finds a way NOT TO BE jealous of her younger sister. I pray for my nephew that is experiencing pain from a tumor that he completed chemo and radiation on just 2 months ago. Please dear lord let it be a side effect from treatment that the doctors can help him with. This little boy brings so much joy to so many…please let him live a life of peace and joy. I pray for my mother in law and the pain she endures everyday. Please give her moments of peace and joy and allow her to thank you lord. Please lord let my job continue with enjoyment and silence those who do not speak the truth. Most Holy and Might Lord, please heal your servant Fr. Floyd who has cancer as it was in remission… Give Fr. Floyd the strength to endure his suffering. May Fr. Floyd continue with has faithfulness in trusting your Might & Holy will. Please intercede for those devout men who have a calling to the Priesthood. God’s people who have a real desire to live in religious community. This I ask in Jesus Holy name. Amen ???? ???? ???? I pray that Gov. Hutchinson will commute the death sentences of the four inmates that are scheduled to be executed starting on Easter Monday, to life sentences. I pray also for the families of their victims, that they will find comfort and peace during this undoubtedly horrible time. Pray that l can have more understanding for my husband who is a good man. Help me to become more active and less anxious and have at least some feeling of happiness. May Jeff rest in peace and comfort be given to his sorrowing family. In the am of the father. I’ve been praying and fasting for my man to propose marriage. Am still praying and am asking my fellow Christians to pray with me, am believing God for this i know he hears me when i pray. This is my prayer request, I’ll surely come back to testify. God bless you all. Lord i present to you my rev. Sr. Uchey and all religious men and women today. Bless them all as we watch and wait for your Glorious Resurrection. Amen??? ?